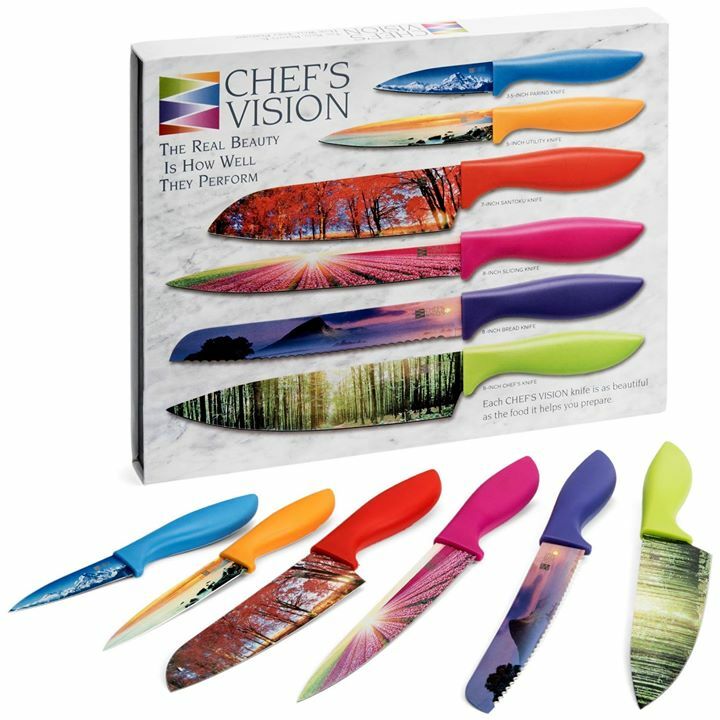 We had the opportunity to facilitate a review for The 6 piece Color Landscape Kitchen Knife Set from Chef's Vision. I have a new kitchen obsession. The 6 piece knife set from Chef's Vision is an art set in a luxury gift box. These picturesque works of art are a beautiful conversation piece to add to your kitchen. I have got many compliments and questions about where I got the knife set. I love showing them off. As beautiful as the landscape art is on these knives, they work just as beautiful. The knives are made from a high quality razor-sharp stainless steel blades. The ergonomic handles are color coded making it easy to find the knife you need to use, helping with cross contamination. 3.5 Inch paring knife is a small knife with a plain edge blade for the delicate coring and peeling of fruit. 5 inch Utility knife which is sized between chef's and pairing knife. This knife is handy for slicing cheese and fruits. 7 Inch Santoku knife also included has a straighter edge than chef's knife with dimples on blade. 8 Inch Bread Knife: a serrated slicer with a plain blade point designed especially for bread slicing although it can also work for other foods that have a firm crust but soft center, such as tomato or flaky desserts. The long, wavy blade delivers a clean, effortless slice through the hard outer shell without crushing the interior. 8 Inch Chef Knife: an all-purpose knife that is curved to allow the cook to rock the knife on the cutting board for a more precise cut. As you get comfortable with the chef's knife size and weight, it can be used for a large variety of kitchen tasks from fruits, vegetables, meats and fish to delicate herbs. This 6 piece adds style to our kitchen. I love the quality of the knives and the food release ability makes it ideal for a wider range of cutting tasks. The multi purpose design makes it a great alternative to the chef's knife for those of us that find it overly heavy or large. The knives are easy to wash and dishwasher safe. This set would be a perfect birthday, anniversary or any other holiday gift. They're a great addition to your kitchen. 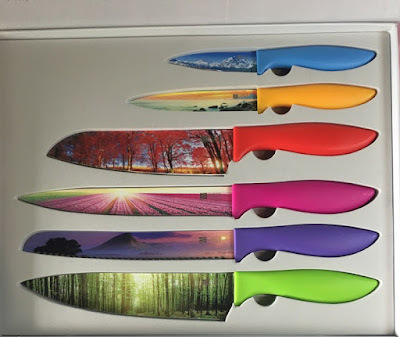 You can purchase The 6 piece Color Landscape Kitchen Knife Set from Chef's Vision: Amazon , you can also connect with them via: Facebook and Chef's Vision Knives Website . They really are rather beautiful!! I'm glad to hear that they are functional as well. These would make a perfect gift for anyone who cooks--or even myself!! 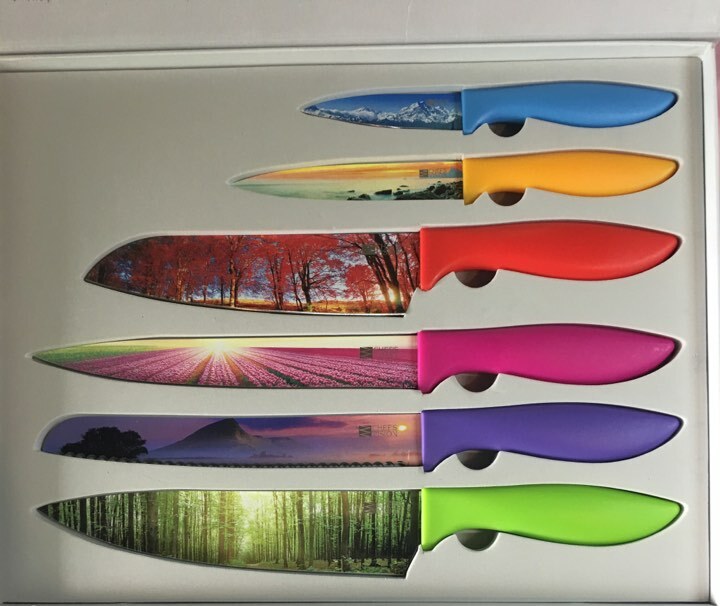 Those knives look wonderful. I wouldn't be embarrassed when someone is helping me in the kitchen, some of my knives are rather old. awesome! I would love to have these in my kitchen! They are gorgeous! It's nice to hear they are functional too! These are really awesome! Love the colors and designs! These are a neat gift idea! Very beautiful, would want to use them too much. Oh my goodness! I love these knives! So cool looking and they'd look amazing on our magnetic knife holder!